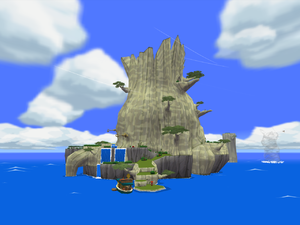 Once you defeated Gohma, you'll be transported at the start on Dragon Roost Island in which Komali and Medli thanks Link. Valoo expresses his gratitude in ancient Hylian. Medli translate's as "use the Wind God's wind" but isn't sure what that means. She suggests you visit the Wind Shrine off the island's southern shore. Take out your baton and the first song will be repeated twice. The Wind's Requiem is . Cyclo will then brief Link to take on his brother Zephos if he wants to require a warping spell. For now use Wind's Requim to direct the wind to go south before sailing. But before you leave the island, Merman will pop up, do a sketch, and says that his friends will help fill in the sea chart as long as you have an All Purpose Bait. Notes: Wind's Requiem is important in allowing you to sail in a direction you want to go. It will be hard if the wind is going against you, completely slowing you down if you're going in another direction. Also it's important that your sea chart is completely filled up, so you can compare where the treasure location is, what islands you need to go to and most importantly, once you acquire Zephos teleportation music is to find out where you warp to. When you reach Forest Haven, you need to go over a few obstacles. Be careful not to fall in the flowing water which leads on to a waterfall. To deal with the River Octorok, just raise your shield in the direction of the River Octorok. in which his spike ball attack will reflect back at him. Then use your grappling hook to swing to the entrance of the Great Deku Tree. When you get to the Great Deku Tree, you'll encounter several ChuChus and if you don't attack them all in time, the remaining ChuChus will get back on the Great Deku Tree but you need to roll on to the tree to be able to knock them down. The red ChuChu takes one hit but the green ChuChu takes two. 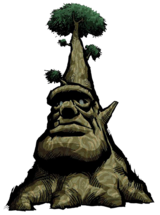 To get the Farore's Pearl talk to the Great Deku Tree; and he says he'll start a ceremony with the Koroks. However, one of them, Makar, is missing, so you must go to the Forbidden Woods and save him. But he can't get in without one main item? A Deku Leaf. To reach it, you need to go on purple Buba Buds to get to the top. How it works is hold the control stick on the direction you will jump to. It also acts as recharging the magic meter. If you're not ready to fling across, let go of the control stick and he will still go back into the purple Buba Buds. You must hold on the direction until you land on another purple Buba Buds or on a leaf on a tree. Halfway up the tree, you have to use the grappling hook and re-adjust to reach another purple Buba Buds, then fling yourself to the top to get the Deku Leaf. Then glide to the ground with arrow signs in grass. When you get outside in the arrow direction, use Wind's Requiem to direct the wind to a south-west direction, to a small high island with the swirling updraft. Then use Wind's Requiem to direct the wind to north-west and time yourself to catch the swirling updraft. Try to avoid the Peahats to get to the entrance. Note: If you already own a pictograph and already did the pictograph side-quests, in this area where the Great Deku Tree is, look around until you find a fly which changes color. Make sure you have an empty bottle to catch it so Lenzo can make a color pictograph which helps with taking colorful pictures. Don't bother getting the fly that changes color. Plus you get what the Great Deku Tree is saying at the beginning. Lastly, the best part is the Nintendo Gallery which you find elsewhere around this island. This page was last edited on 2 June 2017, at 13:48.